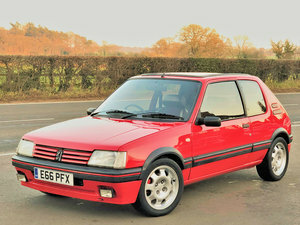 This stunning 1991 Peugeot 205 GTI 1.6 has covered just 55,711 miles from new. The sorrento green pearlescent paint sparkles in the bright sunlight with an almost flip effect to the paint which reveals a candy green under direct sunlight then changing to a very dark green under shade. 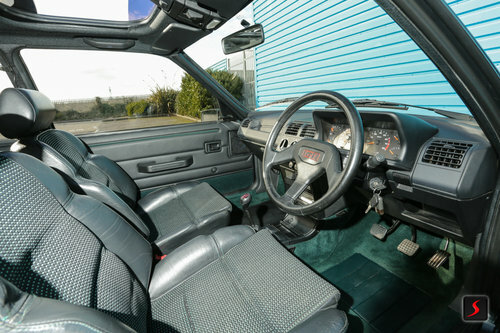 The quality of finish looks as though it’s been pulled out of the showroom back in 1991. All front and rear lights and lenses are brand new. We have managed to source a set of genuine brand new Siem driving lights which were sourced from a collector! All rubbers are in perfect condition with trim maintaining a deep and correct finish. All windows have matching etchings. 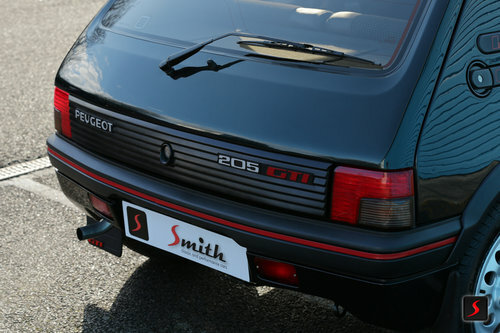 To the rear the 205 GTI has a set of genuine brand new tailgate badges, these also make the car pop! The underside and arches are in a superb condition after receiving a thorough deep clean to protect from the elements, furthermore rust prevention was carried out to protect for the future. 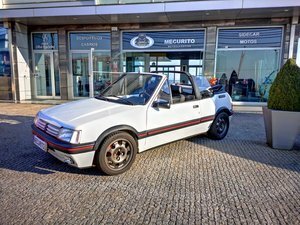 The original brake and fuel lines are present, the spare wheel has a brand new matching Pirelli tyre with 1.6 GTI alloy wheel, original jack and boot spanner present. Underside has no accident damage to structures. Quartet velour/leather: Black/green is the interior seat trim with a green tufted carpet, offset against the pearlescent paint this looks extremely attractive. A brand new GTI gear lever has been fitted which sits alongside the GTI steering wheel. The green carpet is protected by period black Peugeot carpet mats. Headlining, door cards and dash are free from any damage or cracking. The boot area is spotless, while the original parcel shelf is uncut. We have however been unable to source the correct Clarion 97001F cassette radio. In its place is a modern Sony cd player with an aux connection. The search continues! 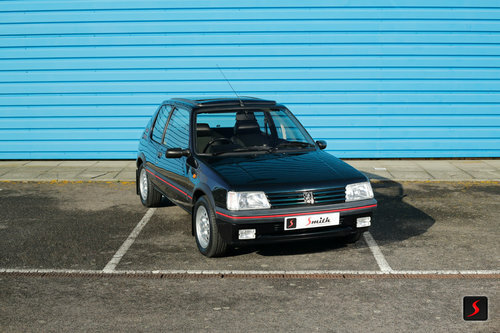 The 1580cc GTI engine and 5 speed transmission have matching numbers. A major service has been carried out by a specialist less than 50 miles ago. This included a brand new exhaust system from the manifold back and many other items replaced due to age. A full description is listed with the supplied invoice. 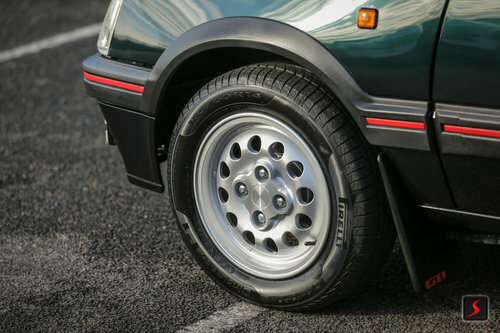 The original GTI 1.6 alloy wheels are finished in the correct silver with a diamond cut finish to the centre, these look like new following a wheel refurbishment. Fitted with 5 brand new Pirelli premium tyres, 185/60 HR14. Brand new front discs and pads have been fitted with refurbished rear drums with new brake fluid and new rear wheel cylinders. To finish the look we have managed to source a set of genuine brand new front and rear mud flaps with matching GTI badges! These were a real struggle to locate, sourced from a collector who had this set stored away, they set the GTI of beautifully. 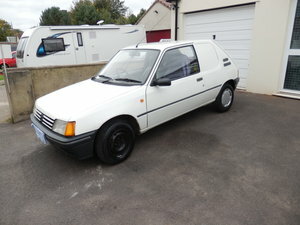 Supplied new by Peugeot main dealer The Oval Motor Co Ltd Westbury Wiltshire on the 02nd August 1991 to Mr R W Porteous. 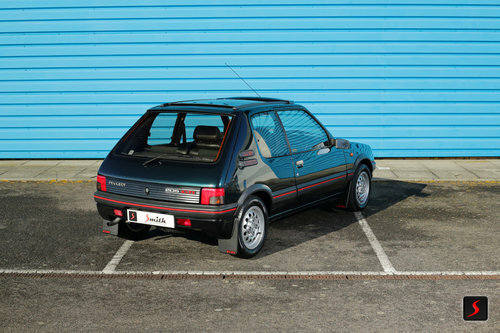 The 205 GTI’s service history file is complete containing the original V5, original stamped service book and a vast amount of main dealer stamps, 18 stamps in total plus the main dealer stamp for the 1000 to 1500 mile oil change and fluid check and a vast amount of mots and tax discs to verify the 55,711 miles. 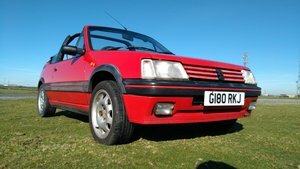 The 205 GTI comes with the original owner’s folder which contains the owners handbook, Clarion radio owners guide, maintenance/warranty book and dealer location guide, 3 Peugeot range brochures, two sets of original keys and one Peugeot immobiliser pad. 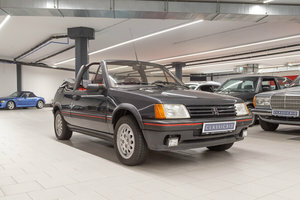 This is an opportunity to own a very rare Peugeot 205 GTI 1.6 in sorrento green with low mileage, a documented service history, in a turnkey condition after 65 hours of skilled labour and to finish in a beautiful condition! All recent work is warranted, all invoices will be supplied with the cars service history file.